If you’re itching for a quick getaway, consider a day trip to visit one of these six nearby jewels. These towns will steal your heart and captivate your soul at every turn. Whether you’re looking for some front porch sitting with a sweet tea in hand, or a swanky martini bar with house music playing, you won’t have to go more than a few hours away for the perfect getaway. Check out some of what these nearby cities have to offer, and if you decide to stay the night, we offer suggestions for where to stay, too! Located at the top of Lookout Mountain and with the highest elevation of any town in the state, you’ll find the quaint little town of Mentone, Alabama. This Appalachian wonderland was incorporated in 1935 and has been captivating lovers of the outdoors ever since. With a population of only 360 permanent residents (as stated in the 2010 census) and an area of just 4.7 square miles, Mentone is the perfect spot to unplug and soak it all in. Plenty of activities to either pick up the pace or kick back during your stay are available in Mentone. We recommend checking out Little River Canyon National Preserve and DeSoto State Park for anything from kayaking to snow skiing and everything in between. Breathtaking views of the surrounding mountains, valleys and waterfalls are in no short supply if adrenaline isn’t something you’re seeking during your stay. You also won’t want to miss the Log Cabin Shops in the center of town. Craftspeople and creatives from around the area gather here to sell unique goods you won’t find offered anywhere else. Get some grub at The Wildflower Cafe, Plowshares Bistro or The Green Leaf Grill before heading back home. Learn more in our full article on Mentone. Little River Canyon is simply breathtaking! There is no shortage of sites to see when visiting Mentone! The mention of Tupelo, Mississippi, typically brings about the same thought provocation in just about everyone’s minds. Yep, you guessed it — it’s the hometown of the King of Rock ‘n’ Roll, Elvis Presley. But beyond that, Tupelo is a town with deep history that dates back to pre-colonial Native American settlements. The city has stood the test of time with notable historic events such as the Battle of Tupelo during the Civil War, and it became the first city electrified by the Tennessee Valley Authority during the Great Depression. In modern times, Tupelo has developed as a stronghold for tourism within the state, as well as a near perfect midway point between Birmingham and Memphis, so make sure to take a visit and see what this town is all about! Tupelo’s best areas for shopping include Downtown, Midtown and Barnes Crossing. All of your national favorites plus local purveyors of all things retail are available in these three districts. There are great opportunities for hiking and sight-seeing just outside of central Tupelo, too, and you’ll want to make sure you check out the famous Tupelo trees, or black gums, that spring up throughout the area. Learn more in our full article on Tupelo. A visit to the Tupelo Buffalo Park & Zoo is a must. Elvis Presley’s mom, Gladys, bought him his first guitar at Tupelo Hardware; Elvis had wanted a shotgun. Memphis, located in the southwestern corner of Tennessee, is the second largest city in the state and one that has made quite the name for itself as a true Southern staple. Whether you know it as The Blues City, The River City, The Birthplace of Rock ‘n’ Roll or The Bluff City, there is no shortage of activities to help you experience its truly unique culture. An array of notable musicians made a name for themselves in this town, including Johnny Cash, Justin Timberlake, Isaac Hayes and W.C. Handy — Oh, and Elvis! — just to name a few. Memphis prides itself on being a diverse town with a quirky, high-energy vibe, so make sure to experience as much as you can to get the full picture during your visit! The area around Beale Street is the perfect place to take some time walking in Memphis. There are a number of cafes and restaurants that will pull you in as you meander about the street with their wafting smells of awesome food and soundtracks for a fun time! Then, make sure to check out some of the local educational attractions, including the National Civil Rights Museum, Memphis Brooks Museum of Art, the Memphis Zoo or Shelby Farms Park. Later on, you’ll have your pick of bars, pubs, clubs and taverns to finish off the adventure. Don’t leave without watching the Duckmaster at the Peabody Hotel lead the famous Peabody ducks to the fountain at the center of the hotel. It’s a tradition like no other, and it takes place twice a day, every day. Learn more by reading our full article on Memphis. The Memphis Zoo is a must on your visit to the Bluff City. The Peabody Ducks have been walking the red carpet for decades, and it’s a tradition that never grows old. Just north of the Georgia/Tennessee line sits the beautiful town of Chattanooga. The city was originally incorporated with the thought of having a great location for river-backed commerce, but later developed as a boom town during the expansion of the railroad. Known as the place where “cotton meets corn,” Chattanooga played a big part in the growth of agricultural trade in the South. Throughout the years, Chattanooga has held on to its reputation for being a transit hub within the region, but you’ll find that there is so much more to experience than just roads and railroads when you take a look around. This rapidly growing city with a small-town feel has tons to offer for the weekend traveler. Chattanooga staples include the historic Chattanooga Choo Choo Hotel and the renowned Tennessee Aquarium. Check out many of the repurposed and revitalized areas with gorgeous historic buildings at the Bluff View Art District, the Riverfront and Warehouse Row. It can’t go unsaid that Chattanooga has one of the best varieties of outdoor activities, and that is a big draw to the area for many visitors. Whitewater rafting, paddle-boarding, kayaking, hiking and biking are all available if you’re in need of a little fresh air and recreation. Learn more by reading our full article on Chattanooga. Atlanta is one of the big boys, a top dog, a powerhouse of the South, and if you’re looking for a true urban experience that’s just a hop, skip and a jump away from Birmingham, it’s your town. A quick trip straight across I-20 will take you directly into downtown in just about two hours. With a sprawling metropolitan reach and an area inside the perimeter (of I-285, that is) split up into many unique boroughs, there is hardly any activity you couldn’t find in the city. Where to start? There is so much to do in Atlanta, you might just want to stay a few extra days to experience it all. With MLB, NFL, NBA, MLS and WNBA teams all located in the city and the brand-new Mercedes-Benz Stadium and SunTrust Park, any sports fan will tell you that this is a great city to catch a game. Cruise around the city on MARTA, the public transit system, so you won’t have to drive about in the notorious traffic. Numerous shopping areas and a slew of critically acclaimed restaurants will keep you captivated throughout the trip. Some of the most notorious spots you’ll want to check out are the Fox Theatre, World of Coca-Cola, Georgia Aquarium, CNN Center, Center for Civil and Human Rights, High Museum of Art, Atlanta Botanical Gardens, College Football Hall of Fame and Piedmont Park. Take your time when exploring this unique Southern city! This destination is likely more than a day trip, but Fairhope deserves a space on this list! If you feel like taking a quick trip to L.A. (lower Alabama, that is), look no further than the coastal town of Fairhope, located on the eastern side of Mobile Bay. Settlers came to this area in 1894 in hopes of establishing a Single Tax Colony based on the utopian ideals of the famous economic thinker Henry George. Their eclectic, free-thinking spirit still encapsulates the town as it’s developed into a sort of sister city to nearby Mobile. While you’re in town, there are a number of things you’ll want to do to get the full experience from the city of Fairhope. Of course you’ll want to stop by the beach and catch some rays, or maybe just spend some time meandering about the many walking trails and public parks that the city has available. If you’re lucky enough to be visiting during a “jubilee,” you will be hard-pressed to find better fishing on the Gulf with the array of marine wildlife that come close into shore just waiting to be caught! You won’t regret spending some time in the boutique areas of downtown, including Fairhope’s French Quarter, that house perfect spots for a little retail therapy or a bite to eat. This beach town will have you embracing the “No shoes, no shirt, no problems” state of mind from the second you arrive. Learn more about this charming town in our full article on Fairhope. Fairhope is a beautiful coastal town in Southern Alabama, and it’s totally worth a visit! 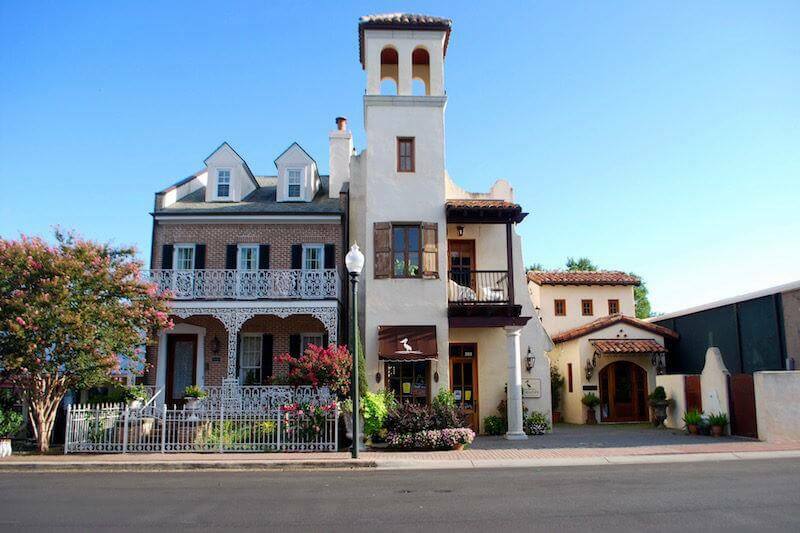 Fantastic shopping, delicious food and beautiful architecture await in Fairhope. Safe travels as you get out of town, if only for the day! Find more fantastic Southern destinations in our travel section!